KC Irrigation was started in 2010 in the low point of the economic recession. During this period KC Irrigation learned the best and most efficient ways to operate as a company. 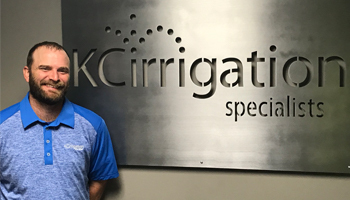 Through hard work, dedication and customer satisfaction, KC Irrigation survived and has grown to be one of the largest and most respected irrigation companies in the Kansas City area. Our projects range from small additions to very large commercial installations. We are a full-service irrigation company which includes servicing your existing system with Spring start-ups, repairs and winterizations as necessary. In any project, we focus primarily on customer service. No project or service is complete until 100% satisfaction is obtained by our customer. With KC Irrigation’s senior staff all being trained and developed in the Golf Course Maintenance industry, you can feel comfortable knowing we can help develop the best plan for your landscape’s needs. A graduate of Kansas State University with a degree in Golf Course Management, Greg spent nearly 12 years on the Golf Course as an Assistant or Golf Course Superintendent. That experience prepared him to start KC Irrigation Specialists in 2010. 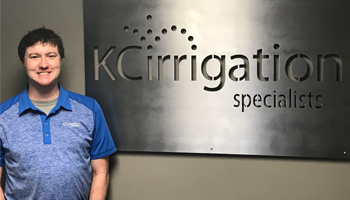 Since starting KC Irrigation, Greg has received the top certifications from the Irrigation Association for Certified Irrigation Contractor and Certified Irrigation Designer. Greg was born and raised in the Kansas City area, and loves spending time with his wife and 2 kids in Leawood. His main drive is to make KC Irrigation a better company every day. 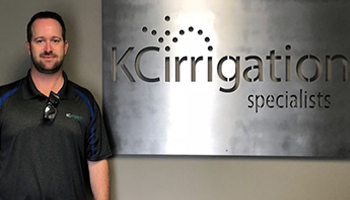 Living in Kansas City since he graduated from K-State in 2003, Jeff began his career in irrigation while a student in Manhattan and has followed his passion ever since. He served as the Irrigation Technician at Shadow Glen Golf Club in Olathe for four years before starting his own lawn and landscape service company. In 2013, Jeff joined KC Irrigation as a Service Technician. In his current role as General Manager, he leads the construction staff overseeing all new installations and large projects. Some of his proudest moments are the completion of the Burns and McDonnell World Headquarters in KCMO, and installing a new irrigation system on the field of Arrowhead Stadium in 2016. Jeff lives in Stilwell, Kansas with his wife and 2 kids. In his spare time, he enjoys renovating his house with his wife, coaching his son in baseball, playing golf, fishing, and watching the Royals, Chiefs, and Wildcats. 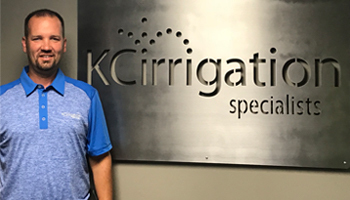 After graduating from Kansas State University in 2004 with his degree in Golf Course Management, Eric spent the next 10 years working in the golf industry before joining KC Irrigation in early 2014. Since then, he has become a Certified Landscape Irrigation Auditor and enjoys the challenges that his position as Service Manager presents. He pushes himself daily to provide the best customer service he can to KC Irrigation’s customers all over the Metro area. Eric lives in Raytown, Missouri, with his wife, and son. Brian has been in the landscape industry for several years. After spending a few seasons in the field, he moved into his current role of design and estimating. He is very knowledgeable of all of the dynamics of how an irrigation system works and is able to convey that information to our customers to assure they are comfortable before we start construction. Brian is constantly working on ways to improve KC Irrigation’s design capabilities through the ever changing world of AutoCAD.